Jennifer Lien is one famous face we can’t just forget despite her fading away from the spotlight after a few acting stints in film and theatre. Between 1990 and the early 2000s, Lien was fully into acting, taking up roles in several movies and television series such as Baby Blood (1998), American History (1998), Rubbernecking (2001), 2001 Rubbernecking (TV series, 1990), Men in Black: The Series (TV series, 1997–2000) and many others. A look at her theatrical career timeline shows that before retirement, she participated in the production of about seven plays, including When You Comin’ Back, Red Ryder?, Othello, Androcles, and the Lion, The Tempest. Most of these happened at the Illinois Theatre Center, showing she really had a diversified career. For some reasons, Jennifer decided to draw her career to a close in the year 2002 and ever since, she has maintained a low-key profile. The former actress, whose birth name is Jennifer Anne Lien, was born on the 24th day of August 1974, in Palos Heights, Illinois, the U.S. As the youngest of three children, she was brought up by her parents in the South side of Chicago, where she passed through difficult times as a little kid. Jennifer shared during a 1992 interview that she was a tomboy while in the area and was much interested in watching television, reading books, or writing plays. She attended a college preparatory school called Professional Children’s School, in New York. It is not known if she went to college, Similarly, details about her family background, parents, and siblings are not available at the moment. She is best known for portraying the fictional character Kes in the American science fiction TV series, Star Trek: Voyager. Jennifer joined the drama club in her in seventh grade in junior high school and when she found she could fit right in, she began working on her acting skills and eventually developed a strong interest in it. She would switch to acting class after she was advised to do so by her eighth-grade teacher. Much later, she got an agent and started appearing in theatrical productions and industrial films. Upon hitting thirteen, the former actress joined the Illinois Theatre Center and later moved to New York to fully pursue a career in acting after the producers of the American TV soap opera Another World asked her to relocate to the city. Jennifer Lien made her debut on-screen appearance in a bubble gum commercial, after which she earned her first TV role in 1990 as a music academy student in an episode of the series Brewster Place, which also featured showbiz mogul Oprah Winfrey. The same year, Lien lent her voice for the dubbed English language version of the French horror film, Baby Blood. The following year, the Star Trek star scored a big role to play the fictional character Hannah Moore in Another World. It was after she got the role that she moved to New York, as mentioned earlier. Lien’s breakout role Kes (an Ocampan, which is a species in the Star Trek universe) came in 1994, which doubles as the same year she provided voice in the American animated series, The Critic, wherein she voiced the fictional character, Valerie Fox. She was also part of the 1998 crime drama film, American History X as the younger sister of Edward Norton. Apart from acting, Jennifer Lien is an avid music lover as well as a trombone player. The former actress also supports several charities and provides assistance to people living with AIDS. She is happily married to Phil-Seon Hwang, a South Korean-born filmmaker and writer. 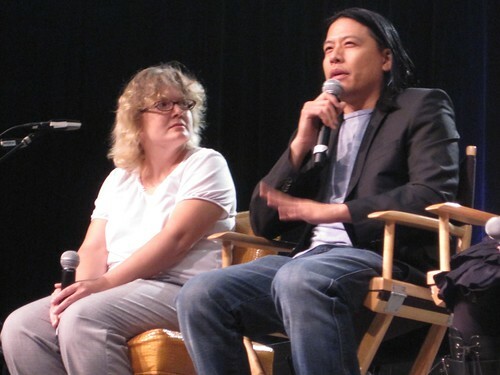 Born in 1962, Hwang is best known for working on projects such as Superboy: The Tween Years (2015), Outcall (2014), and Geek Mythology (2008), which Jennifer was credited as its executive producer. They share a son called Jonah Hwang; he was born on 5th September 2002. It is difficult to tell how much Lien has in her bank account right now. Since she bid her acting career farewell, she hasn’t been reported to be doing any sort of business, which is not so good. According to some authoritative sites, she has an estimated net worth of $5 million as of 2017. Jennifer Lien retired from voice-over work after she gave birth to her son. Sometime in August 2010, she voiced her intention of working as a nutritionist in the nearest future. Recently, the former actress underwent mental health treatment after several run-ins with the law. She is said to have got into trouble with the law a few times between 2012 and 2018, which led to her being charged with several offenses such as indecent exposure, domestic violence, and vehicle-related offenses. Presently, she is taking care of her family and keeping her mind busy with other things as well.